Hebe Dich weg von mir Satan! monogrammed and dated lower right: "f VIII 92"
titled below: "Hebe Dich weg von mir Satan!" 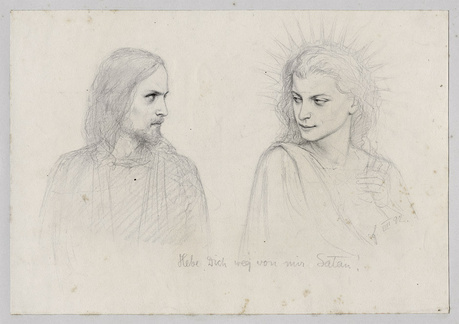 Provenance: Industrialist Dr. Eugen Lucius (1834-1903), Frankfurt a.M, who acquired the drawing directly from the artist. Hilm, Carl. Satan. Vienna and Leipzig: Leinen, 1908.